China's main space contractor is set to carry out its first launch for a 300-plus satellite communications constellation to provide global internet from low Earth orbit on Saturday. The China Aerospace Science and Technology Corporation (CASC) is set to launch Hongyan-1 on a Long March 2D rocket from the Jiuquan Satellite Launch Centre in the Gobi Desert around 08:00 UTC Saturday (03:00 Eastern, 16:00 Beijing time) according to airspace closure notices. This first Hongyan satellite will be used to test L- and Ka-band communication capabilities and compatibility in low Earth orbit (LEO), as one of nine satellites orbited by 2020 as a pilot demonstration for the Hongyan system, which translates as 'wild goose'. The name likely comes from the fact that geese were used to deliver messages in ancient China. The first 60 satellites making up the first phase of deployment of the Hongyan constellation are expected to be in orbit and operational by around 2023, with the 300+ satellite system to be completed by 2025. The Hongyan system will provide global internet coverage including to remote places such as deserts, mountains and out at sea. Hongyan low-orbit Internet satellite constellation. The system is designed to facilitate two-way communications at all times across all terrain, providing a wide range of civilian services such as ground data collection and exchange, ship identification and tracking, mobile broadcasting and navigation signal enhancement. "This is to provide a global solution for our future satellite broadband access and services such as the Internet of Things with our current telecommunication technology," Shi Pingyan, senior vice president of the China Academy of Space Technology (CAST), an institute under CASC, told CCTV at the Zhuhai airshow in November. A facility with the capacity to assemble 130 satellites each year has been set up in Tianjin, a port city neighbouring Beijing. The system is also being tied to China's Belt and Road project and part of the envisioned 'information silk road' in space. 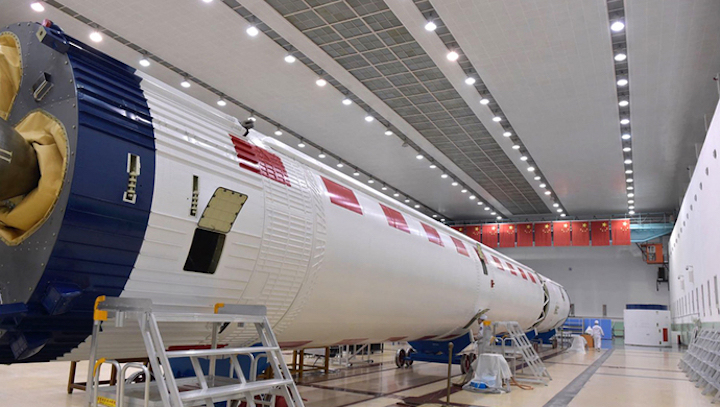 According to the Chinese language web portal Satellite World, the launch will also feature the first use of the Yuanzheng-3 (YZ-3) upper stage, designed for for the Long March 2D and Long March 4B launch vehicles. The upper stage will be capable of up to 20 engine restarts and 10 spacecraft separation events, allowing a single launch to send different payloads to varying orbits. The launch follows the December 24 launch of the first Hongyun ('rainbow cloud') satellite, for a sister state-owned entity to CASC, the China Aerospace Science and Industry Corpopration (CASIC), the country's largest missile maker. CASIC aims to have the 156-satellite Hongyun system, with most at an altitude of 1,000 kilometres, operational by around 2022. While CASC and CASIC are working to establish their systems, US companies Boeing, Oneweb and SpaceX are also developing plans for own LEO communications megaconstellation of small sats. CASC meanwhile is also pursuing greater capabilities with large satellites in geostationary orbit, which have long been the choice for communications. An experimental high-throughput satellite based on the new 8,000 kg Dongfanghong-5 (DFH-5) platform will be launched by a Long March 5 heavy-lift rocket in 2019, likely in the second quarter. CASC and other Chinese entities will not face competition for domestic markets from these rivals, as Chinese telecommunications laws and regulations currently prohibit non-Chinese companies from providing services and products in China.